A semiconductor company in Gresham had an aging chemical dispense system supplied by a company that was no longer in business. OCD Automation was hired to design a PLC-based replacement that would reuse wiring and pneumatic plumbing. OCD Automation was also hired for fabrication and installation during short production time windows. 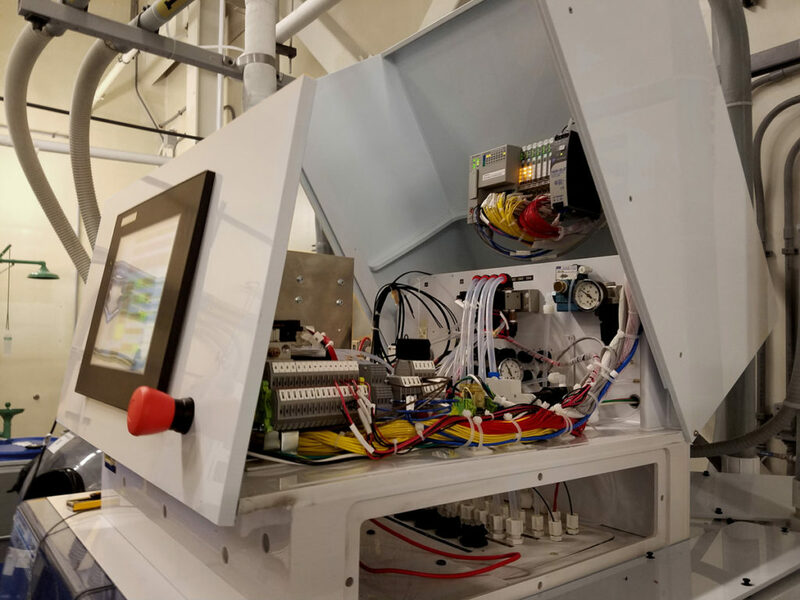 In addition to replacing the controls on 14 chemical dispense units (CDU) of differing chemistry, 15 remote leak/demand detection panels were designed, fabricated, and installed to replace 22 existing remote nodes. All of the pieces communicate over a dedicated Ethernet network, and report back to an industrial SCADA system. Each control panel and CDU have a local touchscreen as a backup to the SCADA system, and to allow for local interaction/configuration. A typical change out took 4-6 hours during a production window. In the spring of 2016, the same client hired OCD Automation to design an “in situ” process using a mobile CDU cart. The cart was designed with quick connections to wiring and pneumatics, so that it could be swapped from the old control system and operate while the permanent changes were executed on the actual CDU. This reduced the change out time from 4-6 hours to a one hour window on the first day, then a one hour window on the second day. This proved to be less obtrusive to manufacturing activities.